Will 2014 be the year that computers based on biological brains finally come into their own? The first commercial version of the new kind of computer chip is scheduled to be released in 2014. Not only can it automate tasks that now require painstaking programming — for example, moving a robot’s arm smoothly and efficiently — but it can also sidestep and even tolerate errors, potentially making the term “computer crash” obsolete. The new computing approach, already in use by some large technology companies, is based on the biological nervous system, specifically on how neurons react to stimuli and connect with other neurons to interpret information. It allows computers to absorb new information while carrying out a task, and adjust what they do based on the changing signals. The new approach, used in both hardware and software, is being driven by the explosion of scientific knowledge about the brain. 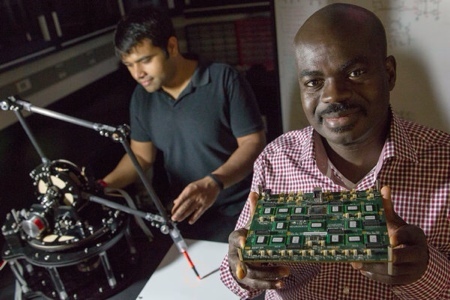 Kwabena Boahen, a computer scientist who leads Stanford’s Brains in Silicon research program, said that is also its limitation, as scientists are far from fully understanding how brains function. ...Detmold had attacked the problem from a different standpoint. It was his theory that the sensations of the nervous system are flashed to the brain as electric currents, or vibrations, and that it was the action of these vibratory currents on the brain-stuff that caused consciousness and thought. Thus, instead of trying to make simple, living cells and from them work up the complicated structure of the brain, he had constructed an organ, a brain, of metal, entirely inorganic and lifeless, yet whose atomic structure he claimed was analogous to the atomic structure of a living brain. He had then applied countless different electrical vibrations to this metallic brain-stuff, and finally announced that under vibrations of certain frequencies the organ had showed faint signs of consciousness.